The 9th Guru was a gentle holy man who loved to meditate in nature. His name was Guru Teg Bahadur. Many people in distant lands loved the Guru and deeply wanted to see and listen to him. Guru Tegh Bahadur felt their love and with that love in his heart he went to meet them. He traveled very far to many places. On his travels Guru Tegh Bahadur met a king named Raja Ram Singh. The raja had been sent to stop the fighting and conflict in the eastern territory of Assam. "Sir, you are True Guru. I beg for your help. My army has to stop the rebel king in the land of Assam. He and his people are lawless and must be subdued. My army can take care of them but the problem is the Magical Land of Kamrup on the way to Assam." Kamroop was famous for being a dangerous and magical land. Guru Nanak visited there long ago and dealt with the magic when it was used on him! "The people of Kamrup may think we are invaders, they will surely use their magical powers to destroy us all. 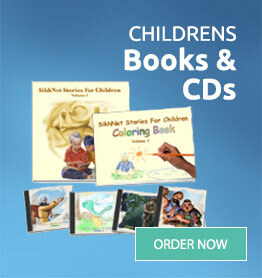 Please help us on our mission!!" "Yes, we will travel together and you never need to fear the strange and mysterious magic." Actually the Guru Tegh Bahadur had a better idea. After the magic is taken care of, a war with the rebel King will not be not needed. Guru Tegh Bahadur got himself and his Sikhs ready to travel. "Let us prepare now to go together to Assam. There, we can revitalize the mission of Guru Nanak and be with the good people of that land." "Oh my beloved guru, Is it wise to go on this trip? The land is so far away and its such a dangerous journey! I don't know of anyone returning alive!!" Guru Tegh Bahadur replied "Keep your gaze upon the light of God that is in everyone, chant Sat Naam. You shall not be harmed." They all knew the truth of Guru Tegh Bahadur’s words. 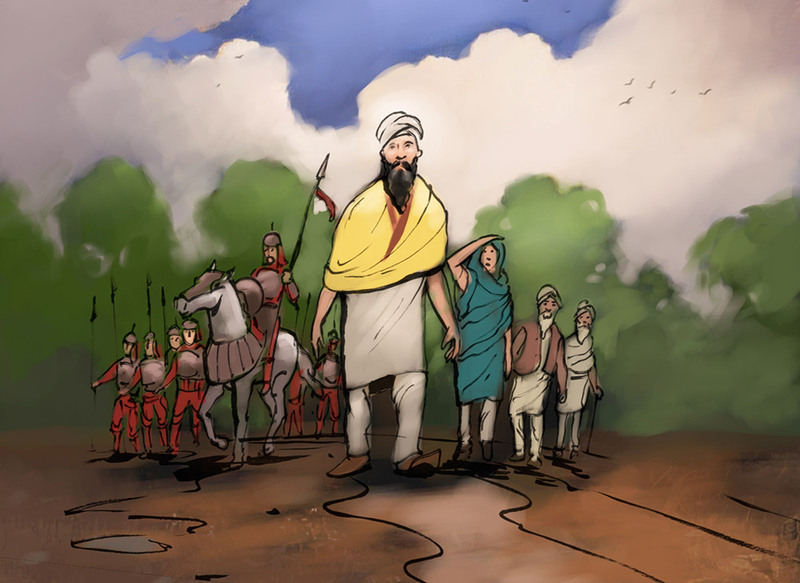 Early in the morning Guru Tegh Bahadur and his Sikhs, together with the Raja and his army, began their journey. They all marched together through the beautiful countryside toward the Eastern mountains. This was the path to the Magical & Mysterious land of Kamroop. Everyone walked in pairs and small groups together chanting Sat Nam and singing and meditating as they walked. "Saat Naam Saat Naam Saat Naam Saat Naam Saat Naam Saat Naam Waheguru! Saat Naam Saat Naam Saat Naam Saat Naam Saat Namm Saat Naam Waheguru!" They walked through jungles and over many hills. The air was filled with the sweet smell of wildflowers and the fresh smell of early morning rains. As they walked they could hear beautiful sounds and birds singing cheerfully. After weeks of travel, the landscape changed from warm jungle in to cold mountains with steep cliffs. As they climbed higher and higher it became colder and colder. When they chanted in the early morning, all wrapped up in their shawls, their breath could be seen rising into chilly morning air. Day by day, they were getting closer and closer. "We are near our destination. We need you to protect us from the powerful magical forces here!! The magical people will think we are enemies and will surely try to attack us!! We need your help! You are the True Guru, keep us safe!!!." Actually, Guru Ji wasn't just there to protect the Raja, the Guru was there to teach the Raja. Guru Teg Bahadur assured the Raja "There will not be any problem. Keep your focus on the Naam and all the beauty you see here. Stay positive. There is no need to fear. There are Sikhs who have lived in this land since the time of Guru Nanak. They have remained devoted to the Guru’s teachings. You see, we have friends here. When light of the God is seen in your eyes, and the kindness in your heart is felt, then you will be loved by all the good people here. The shield of the House of Guru Nanak covers you, you shall be protected." As the soldiers set up camp, news of the Guru’s arrival began to spread. The news of the Guru’s arrival reached the great Temple of Magic known as Kamakhya. The high priestess of the temple called in three of her most powerful witches. "These dogs have come with their armies to take our land and run us away. Well it won’t work. Go now, and get rid of them!!" "Tonight the stars are lined up with the moon just right. Now is the time for us to call upon the powers of gravity and lightning!! We are going to show these people a sight they'll never forget! Hehe, hehe...."
"THE POWER OF A FIRE STORM WE INVOKE!!" Suddenly dark clouds appeared over the Guru’s camp. 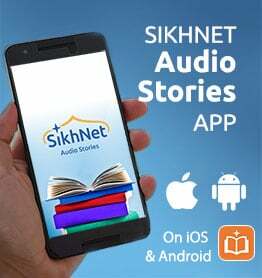 There was loud thunder and cracking lightning as the forces of destruction were sent toward Guru Tegh Bahadur and the Sikhs. "Breathe long and deep and Feel the presence of God within you. Chant the Naam. The powers of the storm SHALL NOT come near those filled with the light of God." His Sikhs began Simran "Waaahe Guru, Waaahe Guru, Waaahe Guru"
The Head witch was confused "This is our est fire storm. why are they are not frightened! They seem unaffected. I know! lets us use the power of gravity. We Invoke the power of levitation." All of the sudden the high priestess appeared. "I came to make sure this job was done properly. If they can’t be scared away, let’s destroy them before they bring their armies any closer to our temple!!" The Witches aimed all their powers together and lifted up a huge boulder. It was as long as 5 men and was incredibly heavy.The massive stone floated in the air. Suddenly they sent the bolder flying across the night sky! But Guru ji and all the Sikhs just continued to chant with hearts full of love. 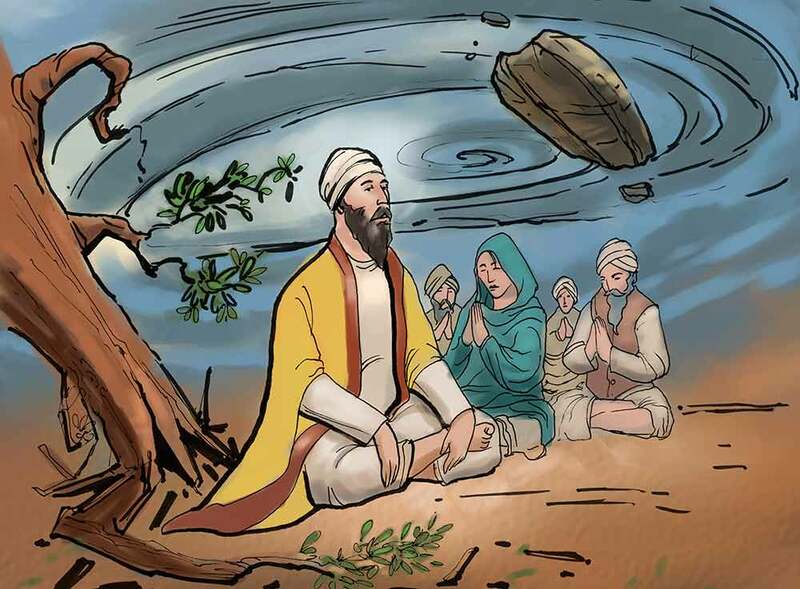 In that calm state of faith all the Sikhs watched the huge boulder speeding toward them through the sky. They did not budge. They all knew that they were safe, they felt no fear. "Waaahe Guru, Waaahe Guru, Waaahe Guru"
The boulder slammed into the ground!.. No one was hurt. The massive stone hit so hard that nearly half of the stone went into the ground! Next the Witches joined their magic together again and uprooted a huge tree!! It floated in the air dirt still falling from it’s roots! They flung it at the Guru’s camp! It landed with a huge crash very close to the Sikhs. They just kept on peacefully praying and chanting. Guru Tegh Bahadur reached for his bow and arrow. He pulled and aimed his arrow at the witches altar. The arrow hit the witches magic channeling crystal on their altar. The witches were suprised and shocked, "Aaahhhh! What happened!!!! We cannot use our magic any more." Humbly the witches admitted, "We've been defeated! This arrow came from a master wizard. He surely could have used magic to defeat us... but instead he used normal human power. This master must be a great magician and a humble holy man. We must go and see this holy person with humility." "My greatest apologies I give to you now. We were very wrong to bother someone as great as you. It’s just that magic is our only defense, we are just trying to protect ourselves, so many people are trying to attack us!" With compassion and grace Guru Tegh Bahadur answered, "I understand. Listen, It is not good to waste your precious spiritual energy on destruction. Now, give up this magic, it only causes harm and suffering. You need not fear Raja Ram and his army. He is not here to hurt you. Let there be peace between all people." The Guru, the Sikhs, The Raja and his army went to Assam and met with the rebel King. With the Guru’s help both Kings opened up more and war was avoided. A peaceful agreement was made between everyone. Guru Teg Bahadur continued to travel, wherever Guru ji and the Sikhs went, they served people by lifting their spirits and sharing the teachings of the true Guru.